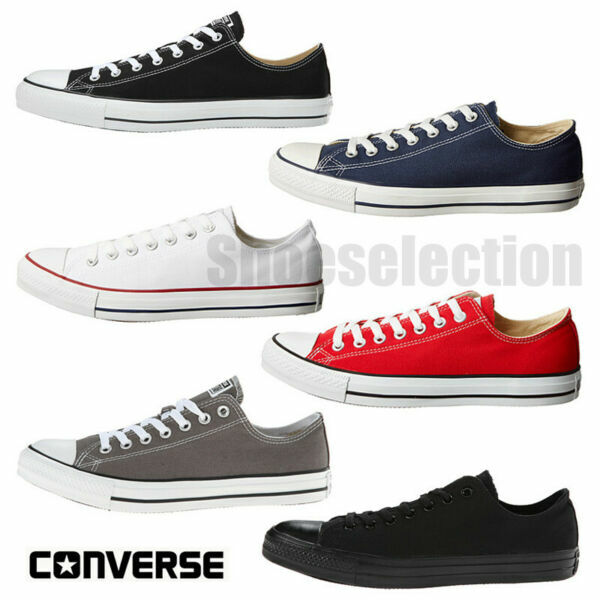 eBay New Document Untitled Document CONVERSE CHUCK TAYLOR ALL STAR LOW TOP SNEAKERS New Without Box Product Information Brand New Converse - All Star - Chuck Taylor - Canvas Low Top Sneakers - Shipped without box to reduce shipping costs. If you need with original shoe box, Please select "USPS Priority Mail" on shipping option. Please Note: Converse All Stars run approximately One Full Size bigger. If you are a first time buyer, we recommend that you buy the next size down. Never Worn ! 100% Authentic Guaranteed ! Payment We only accept payments via PayPal. After you have won the auction, an email will be sent to your eBay registered email address. If you are paying through Paypal using eCheck, note that your item can be shipped only after eCheck has cleared. All payments are expected within 7 days after the last winning auction is closed. A non-payment dispute will be opened if full payment is not received. We only ship the item to your Paypal address for fast and accurate shipment. If you want to change the address, please add a note or send us email when you make the payment. after you have paid. Shipping Our shipping rates include the cost of shipping, handling, packaging and related manpower costs. We are not responsible for undeliverable address. We reserve the right to charge the shipping fee again for returned items due to wrong address supplied by buyer. Any non-received items caused by invalid address registered on PayPal are not in our full refund or replacement policy. Items are generally shipped outwithin 1 business days after your payment has been verified (Sat. & Sun. excluded.) Orders from the United States will all be shipped out via USPS. The shipment usually takes 2-4 business days(Saturday and Sunday excluded),if you need the item urgently, please contact us for detail before purchase. Local pick up is not available. Return We fully guarantee our items. All items are in brand new condition unless specified otherwise elsewhere in the description. All returns - defective or otherwise - have to be preauthorized. Please contact us to get an authorization and returning address before sending the item back. Item must be in the same condition that you received it. Worn merchandise will not be accepted for refund or exchange. The shoes and the shoebox must be in resellable condition for return to be accepted. In all cases, buyers pay shipping fees at their own cost to return products for exchange or refund. We will be responsible for the postage of replacements. NO FREE SHIPPING ON EXCHANGE ITEM Replacement will be made upon receipt of the returned item. Contact If there's any problem, please do not hesitate to contact us by ebay message, we will reply you within 1 business day. (not include Public holiday) Work Hours: Monday to Friday. If you don't get response within 1-2 business days, please check your eBay email or My Messages in case your email provider has an overly- aggressive spam filter blocking eBay or my emails. Please add us in your contact and email us again. Shipping Time & Charge Your order will be shipped within 1-2 business days after we have received your payment. U.S. Domestic Domestic Packages are usually shipped via USPS or UPS from our warehouse in California, U.S.A. Delivery time varies between 1-5 business days or longer depending on the shipping area (i.e Hawaii, Alaska, APO). International International delivery usually takes between 4-8 days for delivery, in some rare cases, it could take up to 8-15 business days. Buyer is responsible for any import duty/taxes levy by the shipping destination country. Feedback and Detailed Seller Rating We are transnational corporations, only strive for 5 star positive feedback and will try our best to offer the best service to our buyer. Please email us before leaving negative feedback or open any dispute and please give us 2 business days to resolve the complaint to your satisfaction. Powered by eBay Turbo Lister The free listing tool. List your items fast and easy and manage your active items. Powered by eBay Turbo Lister The free listing tool. List your items fast and easy and manage your active items.